In a shocking announcement earlier today, Google SEO ‘baron’, Matt Cutts, announced the immediate roll-out of Google Wolf 1.0. Substituting cute names like Google Panda, and Google Penguin, the new Google Wolf 1.0 removes all web sites, domains, links and other useless content from Google. The only result to remain on Google, will be Google.com, along with links to Gmail services. According to Matt Cutts, this adjustment of SEO visibility has been his long term plan as a Google engineer, thus ending all speculations about his active participation at the world’s biggest search engine. 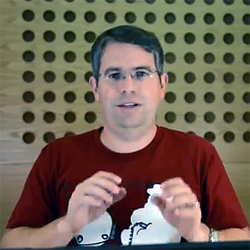 “I am back from a long sabbatical, and there are many great things to be accomplished in the coming months, stay tuned!” exclaimed Matt Cutts. In future weeks, every single link on Google to web sites, domain names and other such useless content, will be replaced to links within Google.com itself. ← Twitter Announcement: Removing the 140 character limit from Direct Messages.